'Drum roll'.....here are the scavenger hunt riddle answers to the brain tickling riddles we set on our scavenger hunt riddles page! After you've checked your answer below, just hit the browser 'back' button to return to the riddle questions page and to the next riddle to solve! 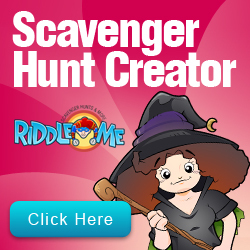 If you have some brain-tickling riddles or fun scavenger hunt party ideas you'd like to share, please take a moment and add your riddles or ideas here.